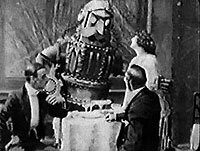 L'Uomo Meccanico (1921) - Sci-fi-central.com. 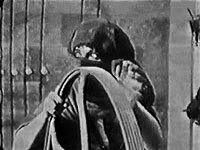 Italy  1921  80m   Directed by: André Deed.  Starring: Giulia Costa, André Deed, Valentina Frascaroli, Mathilde Lambert, Gabriel Moreau, Ferdinando Vivas-May..
A scientist creates a mechanical man but thieves steal it and send it out to kill and destroy a city. 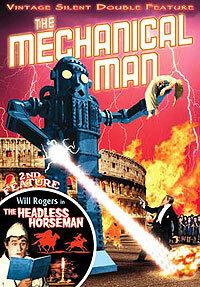 The only way to stop the creature is by creating another mechanical man to destroy it. André Deed was a pioneer comic star who made films in both France and Italy (originally as BoireauCretinetti) and whose career paved the way for all the comic stars who came after. His reputation has always suffered particularly amongst anglophone critics from the usual tendency to try and read history backwards and portray the earlier comic stars as simply primitive versions of Charlie Chaplin. So amongst the English critics, on the basis usually of very little acquaintance with the actual films, he has always passed for nothing but an eyeball-rolling, face-pulling farceur and one sees the sad evidence of that oft-repeated caricature in some of the review here. In fact, even if Deed's comic style was broad, his films often contain very interesting elements of the surreal that is part of a Franco-Italian tradition quite different from the later US comics )even Keaton, whose surrealism is of a rather different kind). In the later part of his career he himself acted less and less, preferring to concentrate on directing and writing and promoting the career of his wife Valeria Frascaroli, who is splendid as the masked villainess in this film. It is a great shame that this film does not survive in a fuller and more continuous form because it introduces some very good ideas. 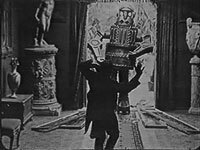 It is not by any means the first appearance in films of automata (the word "robot" had yet to be coined) or mechanical men (the Houdini serial Man of Mystery of the previous year features a very similar automaton) but it is notable in presenting the robot in more believable science-fiction manner (the Houdini automaton turns out to be a fake), particularly by introducing the notion of "remote control". 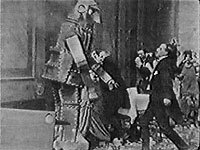 It also plays very nicely on the idea of the automaton - by having the automaton pass as a guest at a fancy dress ball and by having two rival automata fighting it out. Stylistically Deed follows Feuillade quite closely and could not have had a better model. All in all it is an important early piece of science fiction that deserves considerable respect. I believe my description of Deed in the summary is a more accurate one than usually sees. Review by kekseksa from the Internet Movie Database.